O orifíciu da chaminé era pequeno// The orifice of the chimney was small! Os bombeiros// The fire department! Tenho minha casa pra olhar // I have to guard our home! Adoniran Barbosa in São Paulo. This began as a post just about a favorite Brazilian Christmas samba — “Véspera de Natal” — but then I realized it is the first post about Adoniran Barbosa, so I’ve included one of his classics, too: “Trem das Onze.” Alongside Paulo Vanzolini, Barbosa is the best known and loved São Paulo samba composer of all time. 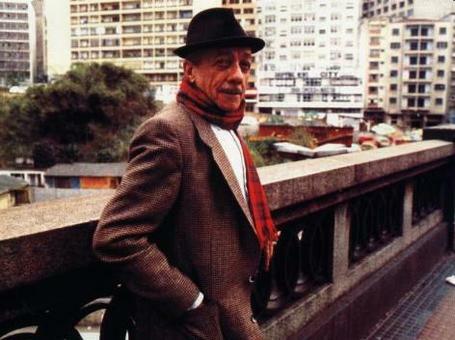 His songs “Trem das Onze” and “Saudosa Maloca” achieved widespread and timeless popularity even in Rio – like Vanzolini’s “Volta por cima” – which is a great feat for otherwise oft-snubbed samba paulista. Barbosa (born João Rubinato, August 6, 1912 – November 23, 1982) was the son of Italian immigrants who settled in the interior of São Paulo. He composed sambas in a humorous mix of Italian-Portuguese dialect and the caipira accent (like hillbilly or country bumpkin) that he grew up surrounded by. Barbosa was born in 1912, but his birth was registered as 1910 so he could begin working two years before reaching the required age of twelve. He did a lot of odd jobs in Jundiaí and Santo André, São Paulo, including boxed meal (marmita) delivery and sweeping at a factory. When his family moved to the capital, São Paulo, he became an ironworker until the iron dust caused too much lung damage, and he went back to other odd jobs. In this documentary he said he was “always composing” while performing these other duties — “I was born wanting to make sambas,” he says. Incidentally, Adoniran never lived in Jaçanã, on the northern outskirts of São Paulo – though he did work there briefly. He just used the name to rhyme with “amanhã de manhã” (tomorrow morning). Thanks. Where’s translation for Trem das Onze? [I adore the earliest 7 min live versions by Gal Costa!] Thanks. Seasons Greetings.